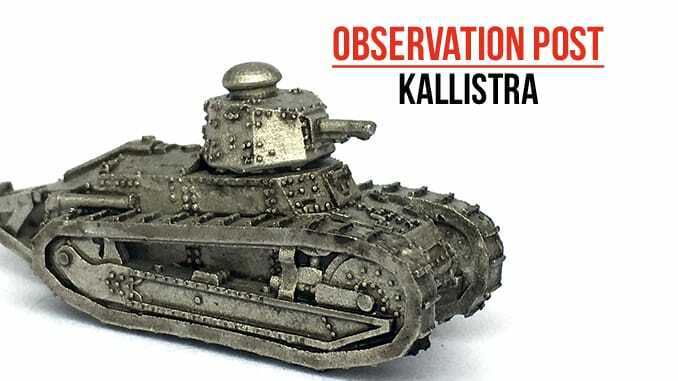 Kallistra have added a number of tanks to their Raging Empires 1914-1918 range. These are all Late War tanks, primarily for use by the British, German and French forces. The single German tank is the slab-sided A7V, even more of a mobile pillbox than the British but slightly slower. Introduced too late in the war to really make a difference, they were easily out-flanked and subject to artillery fire. The French tank releases include the huge Saint-Chamond, with its boat-like shape, heavy 75mm gun in the bow and supporting port and starboard machine guns. Front heavy with tracks that were too short, the tank struggled to cross trenches and cratered land. The next French tank is the Schneider, originally designed to make its way across No Man’s Land and cut through the wire. In many ways, this is an ‘infantry support’ vehicle, with a 75mm gun in the bow and two Hotchkiss machine guns. Slow and prone to breakdowns, it was nevertheless effective against the German Spring Offensive of 1918. The next design is perhaps the most successful and the most ‘modern’ for the time. The Renault FT17 and 18 had an actual fully roatating turret and was designed with speed in mind. It packed a decent punch with its 37mm gun in the turret, which could be replaced with a machine gun for anti-personnel use. Dar faster than all the other tanks, this design saw service across the world during the inter-war period and lasted into the early years of World War Two. Lastly, we have the so-called ‘Whippet’, the Medium Mark A. Used by the British Army, the Whippet was designed to serve alongside the slower British tanks and engage enemy infantry or gun crews with its four machine guns. However, the design was also fast enough to get around infantry formations and could bring a devastating amount of fire to bear. The design proved very vulnerable to field guns and arrived very late in the war.